Someone once commented on a Facebook post of mine: “Research suggests that logical arguments and facts are not what drives change. What really matters is how we make others feel.” Emotions can lead us to accept or reject valid information. This is true. Most people want you to make them “feel-good” about themselves or what you’re talking about. What your saying doesn’t matter if your telling them things they don’t want to hear, either about themselves or something about the world. Many people tend to not care about facts and data that represent reality that go against their prior conceptions. There is a bias to conform what we already know. Those who are not interested in the truth in reality will only listen to people talk about such matters if they like that other person doing the talking. They want their delicate emotional needs to be met before they will listen to any reason. They want to be made to “feel-good” about themselves before they open up to accept the harsh reality they would normally deny. If you make people “feel-good”, then they like you, they trust you more than not, and then they will be more willing to listen to what you have to say. 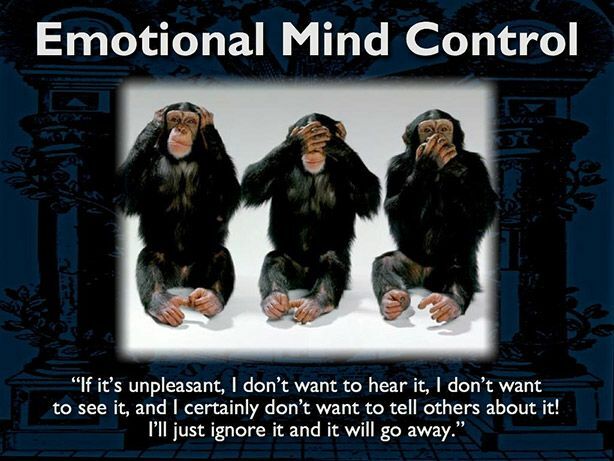 This is called emotional mind control. The truth in reality doesn’t matter. Only when their delicate emotional sensibilities are coddled and appeased, then they will listen to the one who made them comfortable and “feel-good”. Making people “feel-good” in order to influence them and get them to accept what you’re saying, is a clever mind control tactic. Telling people they are wonderful, great and perfect no matter what they do, shuts off their critical thinking and develops a level of endearment or infatuation for the person delivering the message or in the belief itself. This is a “love bombing” effect. Infatuate is from the Latin infatuat, meaning to be “made foolish”, “made a fool of”. This is confused with “love” through knowledge of the substance of being of another and recognition of their being to care for them. We have a chemical trick in our bodies to make us “feel-good” about things. For a prospective mate, it’s to attract you to someone you find appealing, someone who is an ideal mate for perpetuation of your genetics and survival. Infatuation can be from compliments, praise and flattery that is used as a mind control tool. I am weary of those who give me praise (even for my work), as I am looking out for attempts to manipulate me. There is nothing wrong with compliment and praise themselves, but these can be manipulative tactics. Telling people what they want to hear about themselves is a way for them to “fall” for you. But not in “love” romantically, but to fall under their influence because they make you feel good, and to fall for an idea someone is influencing you with. Many “new agers”, “gurus”, priests and politicians know how to do this with clever rhetoric and sophistry of word magic. This is the infatuation, being made a fool of, where you’re being conned, fooled, tricked, duped, manipulated, bamboozled, hoodwinked, screwed, and deceived. Someone is selling something you want to buy because it makes you “feel-good”! The problem with this line of reasoning, that it’s more important to look at how “you make someone else feel” instead of just providing the truth in reality, is that it’s a form of manipulation. Get someone to “like you”, “love bomb” them with word-magic, and then they will be more likely to accept what you have to say, whether it’s true or false, because they aren’t reasoning to begin with, they are in an emotionally mind controlled state. Focusing on how you make someone feel in order to get them to accept your information based on emotional preference, is manipulation. Getting someone to change in alignment with truth isn’t based on the truth any longer, but on how you make them feel. It’s not about “what really matters is how we make others feel”. That’s just one way of manipulating someone into a love bomb “feel-good” emotional state for them to accept something from you that you want them to accept. They will accept it because you are the producer of the “feel-good” emotional state that is being induced into them. They favor what you have to say because they trust you for making them “feel-good”. They are more likely to accept the message you deliver as a result. And this is why those who provide information that people don’t want to hear, that takes them away from their “feel-good” state into a more “feel-bad” state are not listened to because they are speaking about uncomfortable things people don’t even want to accept. It’s true, that one way to get people to accept something is by targeting and placating their emotional sensibilities, their feelings, desires, wants in order to affect their saliency in what they value and weigh as important to them. Having someone “feel-good” towards you will make them value you and what you say more. Why do people take this above route of manipulating people and making them feel good in order for them to accept information? The reason emotion is touted as the target in order to convince someone is because people are putting emotion above logic and reasoning. Logic and reasoning of facts about reality doesn’t often work because people are more concerned about their self-interest, self-concerned and self-centered gains an advantage is that they can get or lose when they’re trying to justify making a decision. It’s not about how you make them feel about some information or decisions they are going to make, but about how they feel about that information or decision that is the real problem. Emotional mind control gets involved whereby information is not honestly evaluated in reference to reality to determine its validity. The feeling that information or a topic generates is the real issue. What “feels right” matters more than whether it’s actually, demonstrably and veritably right or not. What “feels good”, matters more than whether it’s actually good or not. This relates to the saliency of information and how it relates to someone personally. Saliency of information is how you feel about it, what you desire to get from it, and if your desires align with that information, if you that information is personally important to you, and if you value that information. If you don’t value the information then you will not desire it as you see no relevance for it in your life. If you can affect how someone feels about something then you can alter whether they accept it or not because their saliency in what they feel is valuable and weighed as important. This is why facts in reality, a truth demonstrated, doesn’t matter for many people. They prefer to look at how they feel about something and be led through emotional mind control. This is how they think they can determine whether something is true or a lie. Then they are more likely to accept information, that is either true or false, simply based on the saliency of the weight, value and importance they place upon it based on how it makes them feel. This demonstrates the problem with subjective attachment to ourselves and not having an objective appraisal of reality, because then the important thing isn’t what’s going on in reality and the truth therein, but instead it’s about wanting to “feel-good” about ourselves and the information we receive. Through emotional mind control, we focus on “feel-good” deceptions that sustain and maintain the current condition of our lives in the world through maintaining and sustaining the current false perception, self view and worldview. We judge and weigh information from a “feel-good” self-interested, self concerned focus on winning and gaining an advantage in order to avoid a loss. We don’t want to lose our sense of identity of ourselves, our sense of self which is related to our self view and worldview which is based on the information we have so far collected to formulate our self view and worldview. Information that contradicts how we falsely see ourselves or the world is often rejected because we are too emotionally mind controlled both by ourselves and others. Charisma and charm can “magically” charm and put a spell on people, emotionally and cognitively. Chanting (speech tone and repetition) can entertain, amuse, amaze, mesmerize and hypnotize you to induce a state of experience in consciousness. A con-man, a “sorcerer”, can make you experience something that “feels-right” through a convincing false reality, where you judge your experience to be real, “feeling-right”, even though it is false. Deceptions can “feel-good” and “right” but be wrong and false. This is what politicians do with their sophistry and rhetoric to lie and manipulate people’s consciousness into certain behaviors. The entertainment industry, television, “gurus”, politicians, priests, and more, can all amaze, mesmerize, hypnotize, induce, summon and invoke beliefs and altered states of consciousness to entrain us into specific modalities of living. Manipulators know how to appear one way, deceptive and contrary to the demonstrable reality of their behavior. They can be a smooth talker and convince people of false information through the power of word-magic and the science of imagery to invoke “feel-good” states that will relate to them and the message they want you to accept. If it plays upon your personal interests, then that’s another way for them to get you to accept their information and ignore an accurate discernment of what is going on. All the information that we receive from our environment is used to formulate our understanding. Once we accept information from others, our behavior can change in accordance with that newly accepted information. This is how politicians and many others use language to get people to do what they want. To overcome this self-deluded focus on ourselves, and how information reinforces our confirmation bias to make us “feel-good” about ourselves, we need to focus on understanding what is right, good, true and moral. We need to put weight, value and importance on those higher guiding principles. Then we don’t need to feel good about information in order to honestly evaluate it, accept it and then speak about it. Focusing on getting people to trust you by making them feel good, or giving them what they want in alignment with their confused self-interest is a low consciousness approach that doesn’t put truth first, but simply tries to get people to accept something because of how it makes them feel. The focus isn’t on truth, but on personal attachments, self-interest, self-concern and self-consideration all about, me, myself and “my truth, and my survival, my freedom“. It’s very appealing to play into the emotional manipulation game by playing on people’s emotional attachments in order for them to accept information or get them to change. But that is not dealing with the root causal factor of their lower consciousness modality of focusing on themselves instead of the truth that can be verified in reality.